In 2002, scientists discovered that there was an unknown third type of photo-receptor in the human eye, in addition to the cone and rod. That newly discovered photo-receptor is not related to vision, and it contains photo protein called Melanopsin. Its function is to signal the brain for regulating the secretion of Melatonin that may be called as "sleep hormone". Melatonin is secreted at night and has minimal levels during daytime. Increased level of Melatonin makes people tired, while decreased level keeps people awake. 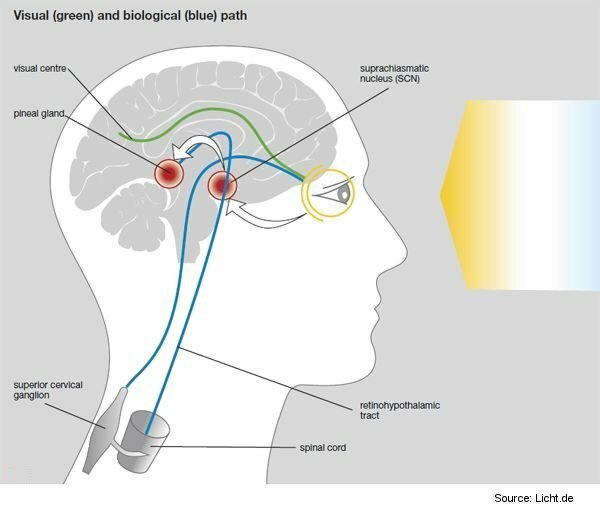 The Pineal Gland produces Melatonin roughly in approximation to the inverse proportion of bright sun exposure in the day and complete darkness at night. Higher level of Melatonin at night makes people sleepy, while lower level in the day makes people alert. There are some cells in the retina of the eye containing the photopigment Melanopsin, and its function is to signal the Pineal Gland for regulating the Melatonin secretion. Among all other light colors, Melanopsin is most sensitive to blue light.